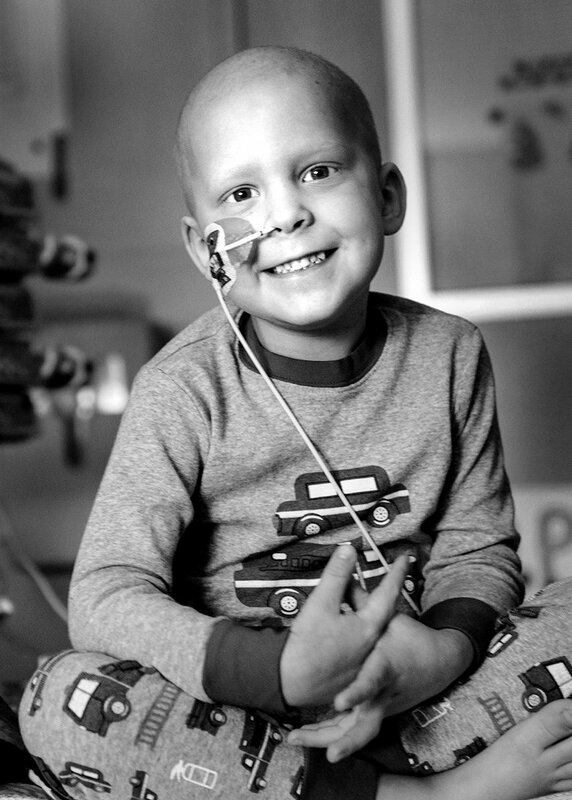 Joshua Reddin Neus, age 4, passed away on August 8, 2017. He battled Acute Myeloid Leukemia for a year before his loving Heavenly Father saw fit to bring him home. He is survived by devoted parents, Brendon and Carrie (Evans) and four siblings, Sawyer (14), Abigail (10), Matthew (8) and Sesilie (6). He also leaves behind a large, close- knit, extended family of grandparents, aunts, uncles and cousins who cheered him on every step of the way. He was preceded in death by his uncle, Brian Thomas Neus. Joshua, affectionately known as Joshy, was born on October 29, 2012 in Mesa, Arizona. Being the fifth child, he held his own with his fiery red hair and a strong-willed personality. He was “all boy” and loved being outside, getting dirty and playing with cars and trains. He was always up for milk with “yummy stuff”, a trip to Grandma’s house or watching his favorite cartoons and Minions. He was a force. Of silliness, of energy, of love and determination. He was stubborn! However, this latter personality trait served him well as he underwent countless treatments and procedures, including a bone marrow transplant, in the fight against his cancer. His family never wavered in their faith as they fought alongside him. As his signature red hair fell, so did their tears, but hope and courage truly never faltered. His doctors and nurses enjoyed visiting his room, commenting on his cheerful personality that masked any sickness. His family will always smile remembering his favorite game in the hospital- hide and seek. How he would giggle, feeling well hidden, but with his tell-tale IV pole always giving him away. The family is grateful to the Make a Wish foundation, which provided them with a week together at Disney World, where Joshy laughed and loved all the rollercoasters! They also want to thank all the doctors and nurses at Phoenix Children’s Hospital for the genuine love and care they provided. Joshua passed away at home in his well-worn “spot” on the couch with a sister holding him and family close by. He was a mama’s boy and she loved him fiercely, tirelessly serving him and being his biggest advocate. Though his life was short his circle of influence was wide. His family aches from the physical loss of their cherished child, but knows they will be together again because of a loving Savior, even Jesus Christ. All who wish to pay their respects are invited to a visitation on Friday, August 18, 2017, from 6-8 PM, at Bunker’s Garden Chapel, 33 N. Centennial Way, Mesa, Arizona. Funeral services will be Saturday, August 19, 2017 at 10 AM, preceded by a visitation at 9 AM, at The Church of Jesus Christ of Latter-day Saints, Mesa East Stake Center, 2228 E. Brown Road, Mesa, Arizona. Love to the Neus family. Heaven is smiling down on you. Just so so sorry, Carrie and family. I wish you strength, love and faith through this difficult time. Well, this is no fun! I only met Josh a couple times, but I know he was part of one of BEST families around. He was certainly loved by a lot of people, and had such a tremendous effect on the world in such a short time! As a family, you sure did your best to keep him here as long as possible – goodbyes are never easy. I’m sorry for your struggle and sadness; but I thank you for sharing so much of Josh’s journey through facebook. You are all an inspiration to me. Josh will be missed for sure but for the Plan of Salvation, we know we will meet again. My sincere condolences to the family for the physical loss of this beautiful child. May you be at peace and feel comforted that he is never as far as a whispered prayer. my thoughts and prayers are with your family. We all loved Joshy! I have prayed for Joshua for a long time not because I knew him but because we love his grandparents and parents. Our prayers now go to those who loved Joshua do much.